As I wash and blow-dry my hair every day, a good hair dryer is really important to me. I have quite long hair too, so letting it dry naturally is hardly ever an option - plus naturally my hair dries a bit fluffy and rubbish. Up until a few months ago I was using a ghd air hairdryer, which I really liked as it dried my hair very quickly, but since it broke down a little while ago I haven't got around to shopping for a proper replacement and have just been using a cheap basic hairdryer I picked up in Tesco in a panic on the day my old hairdryer died! Panasonic's nanoe dryer has come along to rescue me at just the right time - I'd forgotten how nice it is to use such a high quality hair dryer, and it's saving me precious minutes in the morning! The *Panasonic nanoe dryer is a powerful 2,000 watt hairdryer with something called nanoe technology which I understand is like ionic hairdryer but better. It's said to keep a thousand times more moisture in your hair and scalp, preventing it from drying out, and giving a smoother and shinier result. It also has three heat and speed settings as well as a cool shot button, and a nice lengthy cord. The hairdryer comes with three different attachments - a condenser, a diffuser and a quick dry nozzle. I've been using the nanoe dryer for a couple of weeks now and I really like it and think it's better than the ghd air I had before. It's a bit heavier than the cheapie dryer my arms had become used to, but I stopped noticing that after a couple of days. The quick dry nozzle is absolutely brilliant and it's my favourite thing about this hairdryer. It works by doing something technical combining soft and strong airflows which spread the hair evenly to prevent frizz and flyaways. What I can tell you is that it dries my rather long hair in around five minutes, which in itself amazes me, but what's even better is that I can rough dry my hair in that short time and still have a smooth looking result. I've not tried the other nozzles yet as the quick dry one is exactly what I need. and it means straightening my hair is now optional as I get a pretty sleek result just by blow-drying, and I don't need to use as many styling products. The only thing I'd change with this dryer if I could is giving it a swivel power cord. The cord is a great, extra long length, but all my wires end up getting in a twist and tangle eventually. All hair appliances should come with a swivel cord - my straighteners have one and the wire never tangles or coils up... power cord rant over! The new Panasonic NA65 nanoe dryer is available now from Boots and it's priced at £99.99. It seems a lot, but having spent that much on a hairdryer before and then going back to a basic dryer before getting this one, for me I know it's really worth it. When I first heard about Clayspray I thought it was actually a face mask you spray on, which would be a bit messy come to think of it. It turns out it's a pump, not a spray, and you apply the mask with your hands, which is a lot more practical! Clayspray uses pure and natural 100 million year old clay mined from the mountains of the Iberian Peninsula. The reason it comes in a spray pump is to keep the clay fresh and pure by ensuring it doesn't come into contact with the air until you're ready to use it. This is what the masks looks like when you pump a blob out. You can control how much you pump at once depending on how much pressure you apply. I needed about twice this much for my whole face. Before you apply the mask you splash your face with mineral water - I'd assume any bottled water would do for this. Or, like I've done, you can use the Clayspray hydrate H2O spray, which is a bit more convenient. It's a lovely cooling water spray, so this is going straight in the fridge for me to cool down with in the hot weather as well as for using with this mask. I followed the instructions and applied quite a generous layer of the red clay mask, which resulted in me looking like I'd stuck my face into a chocolate pudding. Mmmm. It's the sort of mask which dries and hardens on the skin, and after about ten minutes it looked like this. As you can see it changes to a paler colour as it dries. I think how quickly it dries depends on the general about of moisture in the air around you. Also I think I applied more in certain areas, like my forehead, so that dried more slowly. After about 15 minutes the mask was dry and I allowed myself to have some fun cracking it by pulling lots of different facial expressions. This is probably what I'll look like when I'm about eighty. Because the mask is thick and a deep colour I expected it to be quite messy to take off, and it was. It's not hard to remove though - as soon as you get it wet it returns to something more like its original texture. I used a muslin cloth and lots of hot water to wash the mask off. It took a little while because I'd used a thick layer, but once my face was all clear it felt really clean and fresh. The mask was really good at drawing out impurities from my skin and it was left feeling really matte but not tight. My skin felt a little bit sensitive around my cheeks for a bit after using the mask, but that may have been because I scrubbed a little too hard with my muslin cloth when taking the mask off. About an hour or so after using the mask and after moisturising my skin had gone back to normal with no redness and my enlarged pores were looking smaller and clearer too. When I use this again I'll possibly concentrate it on my t-zone and that's where my skin is oiliest and where I can see the most benefits. You can pick up the *Clayspray mattifying red clay mask and the *Hydrate H2O spray from clayspray.com. Clayspray also have masks for other skin types and surprisingly they do body and hair clay masks too. I'm particularly interested in the deep cleansing hair mask which sounds perfect for over-oily scalps like mine. Wow it's nearly the end of July and this is my only 'little updates' of the month - this month really has gone by so quickly. I think it's all the sunny weather - I've just been spending my time soaking up the sun in my garden rather than doing very much I think. Hot weather in the UK is too rare to pass up an opportunity to get out a sun lounger and a paddling pool! 4 - and randomly, a Despicable Me 2 push pop! I am a grown-up, honest. 3 - who knew they made these? Super lush. The clearing out of the lipglosses is just a small glimpse of all of the massive clear out I've been having - I think it's delayed spring cleaning or something. I just have a massive urge to declutter and got rid of loads of bits I didn't use or didn't need at a boot fair the other week and took the rest of my old clothes to the charity shop. I have a few more odds and ends I want to sell which wouldn't have gone for much at the boot fair so I'm looking for ways to sell those - I love ebay for buying but I'm not a fan of all the rules for sellers, so I'm on the look out for other sites like this one where you can sell your stuff. A good old blogsale is always an option, so I may do one of those in the near future. New look never fail to deliver for me when it comes to shoes. Whether I'm looking for heels, wedges or flats, they have a massive selection and their prices are really affordable. 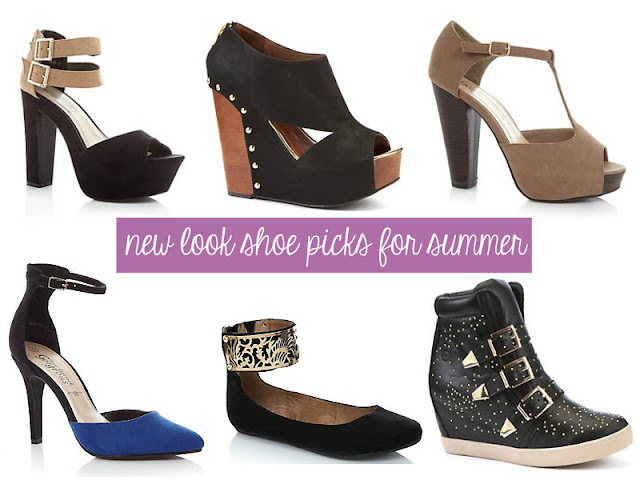 Earlier in the summer when the weather just started to hot up I was in desperate need of some new wedges and peep toe heels for work, and I found the perfect pairs at New Look for under £30 each. I couldn't resist having a browse to see what was new in, and I came across all of these beauties. The chinese laundry wedges are probably my favourites. The tan t-bars are just what I was searching for a few months ago, but New Look didn't have these back then and I opted for my pricier but gorgeous Steve Maddens. I'm torn on the studded wedge trainers, I can't work out if I would pull them off or not, but they're calling to me because they look edgy and comfy all in one! *Fancy hoidaying like Simon Cowell? Then you'll need one of these superyachts - just add sun, sea and sangria - bliss! 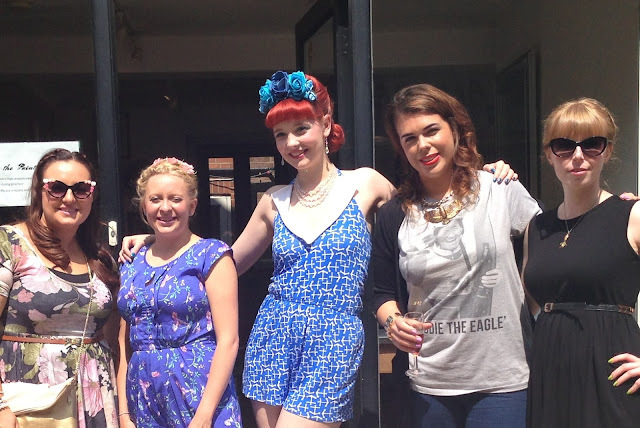 On Sunday I was invited down to The Painted Lady in Shoreditch by Panasonic Styling, to get my hair festival ready for a day at Lovebox. 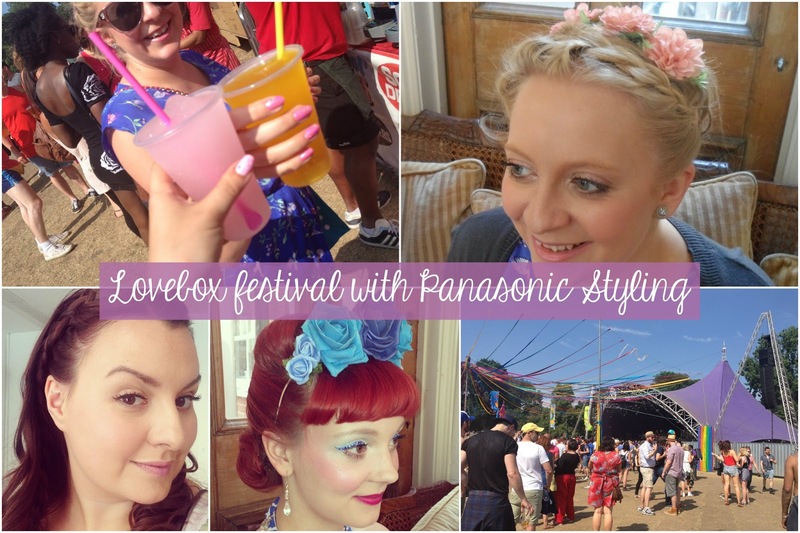 We all got to choose from a list of festival friendly styles, and our lovely stylists got to work armed with the new Panasonic Nano hairdryer and nimble fingers skilled at braiding. Kat from talesofapaleface.com got a gorgeous up-do with braids snaking around her head. I was going to get this, but changed at the last minute so that we didn't have exactly the same! Jayne from jayneskitschen.co.uk went a bit off piste from the usual festival theme and chose one of The Painted Lady's signature vintage vixen styles. And my finished style. My hair was dried into a side parting and the front was plaited before the rest was curled with ghds and set with loads of hairspray. Heather (@fluffypinkystar) got a pretty amazing braid that went all around her head in super-quick time - this was done in about ten minutes flat - seriously impressive! Laura from lauraloubeauty.blogspot.co.uk got a side braid and some bouncy volume ready for her to add clip-in extensions. And our lovely host for the day Gina got the same. With our hair festival ready we donned our sunglasses and floral crowns (okay that was just Jayne), and jumped into the back of a taxi to make our way to Victoria Park. That's where the glamour ended really - Lovebox was dirty and dusty - very dusty, but the weather was gorgeous, the burgers were greasy and the drinks were ice cold. It was a fun way to spend a sweltering summer Sunday. I can now finally say I've been to a festival! I'd certainly do it again, although I'd probably choose one where the music is a bit more of my usual kind of thing (joke of the day was me asking what time Michael Bublé was coming on) - Wireless would probably be one I'd like to do next year, and I have a absolute steadfast no camping rule, so I'm sticking to one day affairs only! I'm currently trying out the same Panasonic Nano hairdryer that was used on our hair at the salon, so I'll be reporting back with all the details about that very soon. What do you think of our festival hair?